This last document regarding Thomas Raleigh and the farce that was his "escape" from prosecution for the Seeberville murders proves that some people just don't learn their lesson. Put simply, Raleigh was a thug. 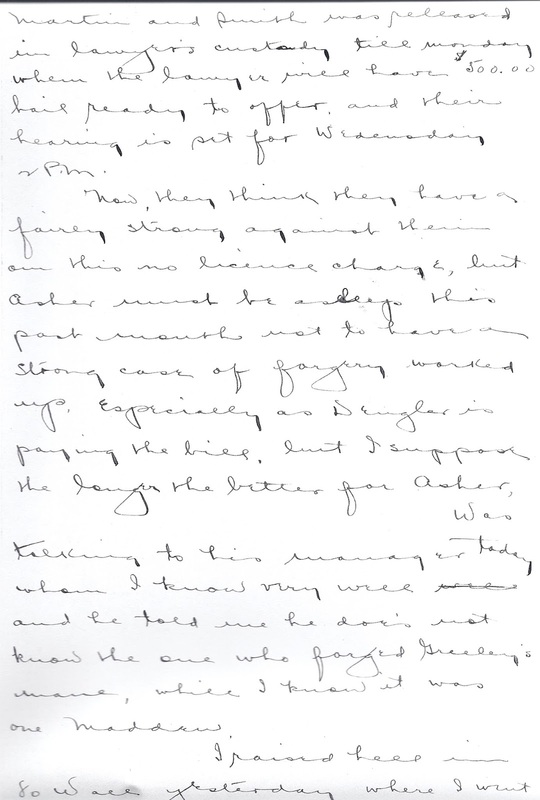 In this handwritten letter we get an idea of Raleigh's exploits in his own words. They are not complimentary to the man, Raleigh, or the people and company (Waddell Mahon and C&H) who hired him to wreak havoc on the Copper Country's striking population. It takes a while to get used to Raleigh's writing, but the letter is a cold look into the psyche of a paid thug. He plainly recounts his exploits while spying in New York and then begins to ask about his next move. Raleigh was a hired gun and seemingly willing to do whatever for the right price. Especially disturbing is Raleigh's willingness to use violence in New York in 1914, even as he is a wanted man for murder in the Copper Country for something he did less than 6 months ago. In fact, C&H knowingly protected the whereabouts of Thomas Raleigh, even though he was wanted for murder. Not only did the company protect Raleigh, it used information obtained by him to spy on WFM activities in New York City. 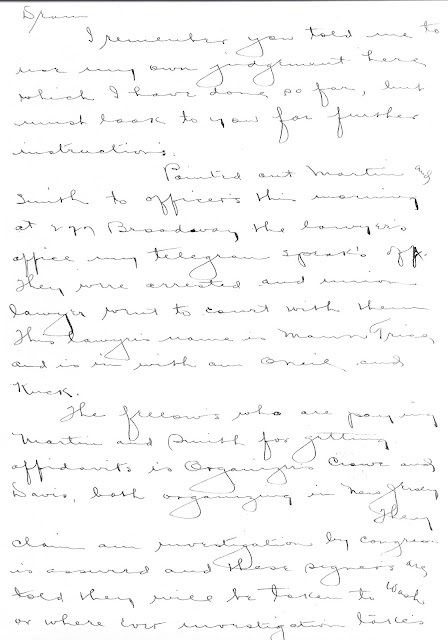 While four of the six shooters at Seeberville were found guilty of manslaughter, Harry James was acquitted under direction of the court, and Thomas Raleigh supposedly fled the Copper Country. 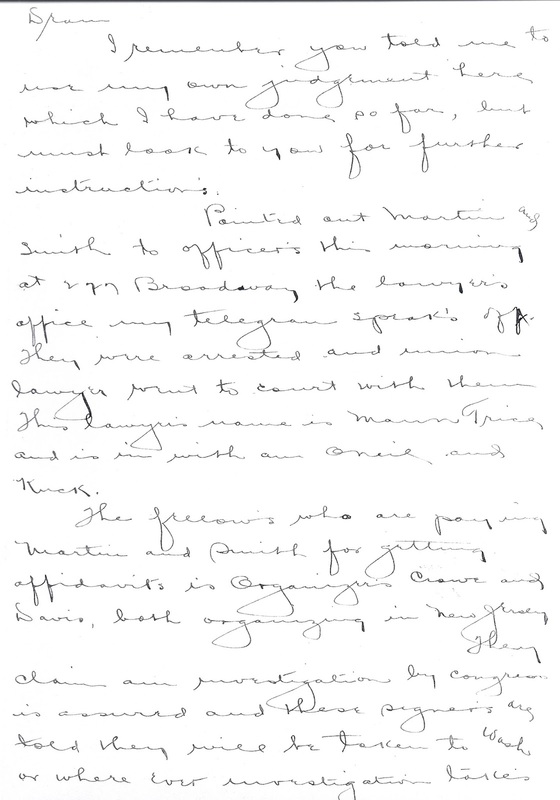 Special Prosecutor George Nichols later wrote to the Houghton County Board of Supervisors that it was thought that Raleigh had indeed left the country, but labor spy correspondence reveals that Raleigh was in hiding in New York by January. In fact, he was spying on the WFM’s New York offices for C&H, providing the fruits of his work as a labor spy to Mr. Robinson, a lawyer in the firm of Rees, Robinson, and Petermann, which was on C&H’s payroll. 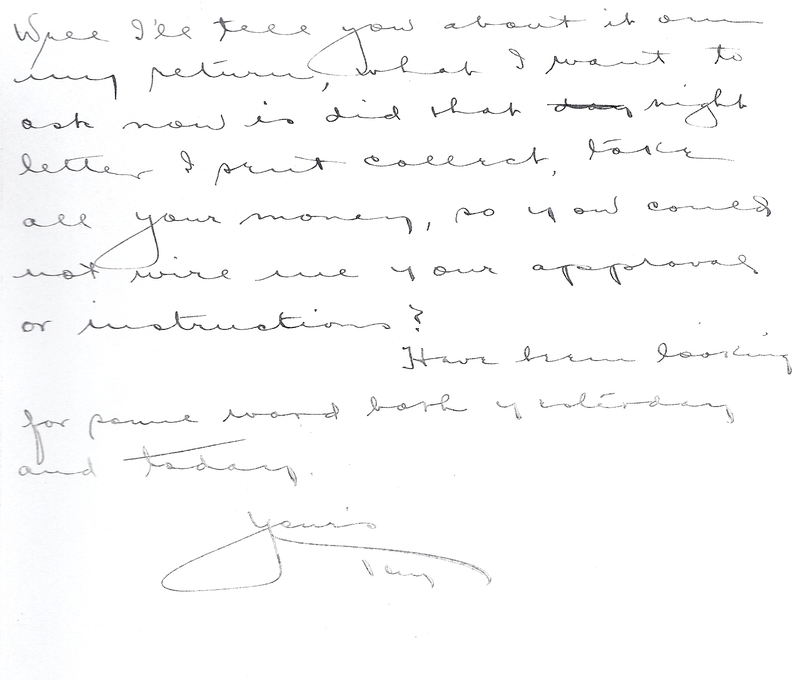 Robinson then forwarded Raleigh’s correspondence to O. F. Bailey, a claim agent with C&H.